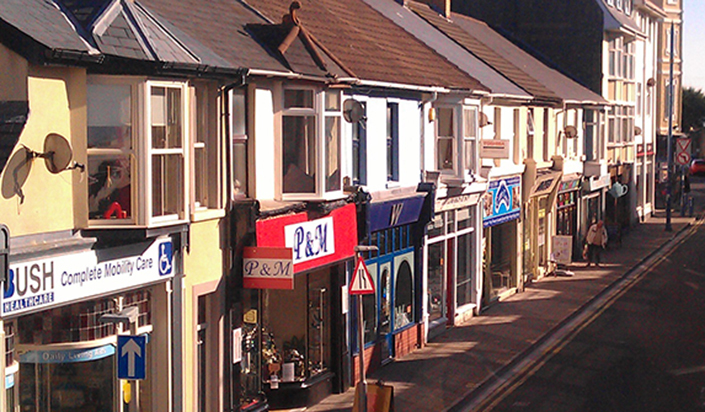 High Street Footfall declines - what can the small indipendent retailer do? The Death Throes of the High Street. In the latest report from the British Retail Consortium they state that – Year-on-year, High Street footfall in April 2018 decreased by 3.3 per cent, a significant decline. The decline in footfall in the towns and cities around the country is seen as the latest indicator to the death of the high street. Many big stores and familiar brands are announcing closures and redundancies as they try to mitigate the losses and restructure to survive. Everywhere you look you see advertising of new brand internet merchants and online merchants. The old order has been usurped by the new boys on the block, the ones who saw the opportunity and took it. From banks to supermarkets they have all been rudely disrupted from their safe high street business models resorting to managed decline. The familiar high street names of yesteryear have been replaced by digital stores and service providers on the internet high street. In 2010 I wrote a series of articles called the Death Throes of the High Street and received many comments from established companies saying it was not true. Even with the financial crisis, I put forward the argument that the internet was not entirely to blame for its demise, however, it would be the contributor to its ultimate demise. Since that time, we have seen a further erosion of the merchants that sold their wears in the bricks and mortar cathedrals to commerce. Why have they declined and why have the digital merchants risen? From banks to utilities companies, who have seen the opportunity of reducing overheads, the relentless move of customers to online engagement has been relentless. Only a few things today cannot be bought online. These involve you being there, such as the euphoria of going to a shop and picking your desired product feeling it touching it and then making the purchase, it is yours immediately. Enjoying the experience of a meal in a restaurant and letting someone else clean-up. Both of these are to do with the emotion or feeling that is experienced not the actual process of making the purchase. This can be done online and delivered to your home. What can smaller companies do to survive? Most of the surviving large stores and chains have adapted to the new digital world those who have not make headlines in the national press when they announce the closure of their business or call in the administrators. These peak every year in Q1 when the new bills for rent and rates come in and they have lost another battle against the internet traders over the Christmas period. The small and medium independent bricks and mortar retailers have been luddites in the digital world. Those who have adapted with a website or Facebook page for their business, use it as a promotional tool to encourage people to go to their shops. A few have seen the opportunity and have put online sales channels to increase their customer base. On average these have seen incomes from their website represent 80% of their sales. For the largest proportion the website they have invested in is little more than an advertising medium that is mainly overlooked, ignorant of the opportunity to tap into the £2.6Billion retail sales online in the UK every week. In my book Internet marketing – How to Get a Website that Works for Your Business, I describe the process of getting a website that makes money and is more than just an advertising medium. The Website becomes the shop and works to bring sales directly to the business. Adding to the bottom line and ensuring the survival of the business. Resisting the advance of the internet and resorting to reducing their staff or bills to maintain a dwindling profit is not the sign of a business that will survive long term. I have just one thing to say: Act and invest in the future of the business by adopting the internet – just like your customers. There are people who want to buy your products and services so make sure you are there to service them. Make sure you are using the technology of their choice to engage, encourage and deliver… for you and for your customers. In the next post I will be looking at what retailers and high street independents can do to develop their online business. The things that they need to understand about online customers and how they can work the internet to get the sales and profit to survive and prosper. After 23 years working in electronics, production and mechanical engineering fields, Nigel has spent the last 20 years working in the field of business development specifically on the internet. Being at the start of the digital economy, Nigel has adapted and applied the principles of business development to the rapidly changing scene of the internet. With it, the creation of new internet business models that work for his online clients is his objective. An author and digital business speaker his book “How to Get a Website that Works for your Business” has helped hundreds of SME business owners understand the principles of online success. Today Nigel has been running a digital consultancy and training practice PelaTis Online Ltd. An independent eBusiness consultancy working with retail, manufacturing and service businesses. His insights and understanding of the way the internet works and the direction it is going makes him the go to consultant for online business success. If you are looking for eBusiness advice and guidance or an eBusiness speaker for your business event… Get in touch by phoning 01639680248 completing the contact form. company’s needs and goals. The training went really well, all questions were dealt with professionally, always in a good and pertinent way." extremely relevant in today’s context and I found it very useful and motivating."